One aspect of my job that I find particularly rewarding is meeting people. Offering opportunities to get outdoors and enjoy being active in nature is core to our remit as a Ranger Service. I’m delighted to tell you that, since the beginning of our events and guided walk programme in mid April, almost three hundred guests and community members have joined in. This is an incredible show of support for Tiree Ranger Service, and I am extremely grateful to each and every person that has taken part. The first event to take place was our Great Easter Eggcase Hunt on April 14th. This event was jointly led by myself and Willie Mackinnon – Tiree’s Youth Worker. Though I produced a written summary at the time [here] I hadn’t fully appreciated the long-term positive impact that this session would have. The children that originally took part seem to have maintained an interest in looking for “Mermaid’s Purses”. On the day, the weather was rather changeable: Instead of collating our finds at the end of the activity, some families took them home to record, while others left the fruits of their labour with me to be processed in one large batch. I must say, well done to those families that actually went ahead and submitted their findings (presumably after a cup of something hot!) – it was great to see the new records popping up online. I was also given one Blond Ray eggcase and three Flapper Skate eggcases from unknown locations around Tiree – these were recorded separately. The event was enormous fun and I had a great time leading it. However, what has struck me since is the number of families that now actively look for (and hopefully record) eggcases as they spend time on the beach. I quite often have children approach me in the Co-op to tell me about their most recent finds! Genuinely, I couldn’t have asked for a better result. 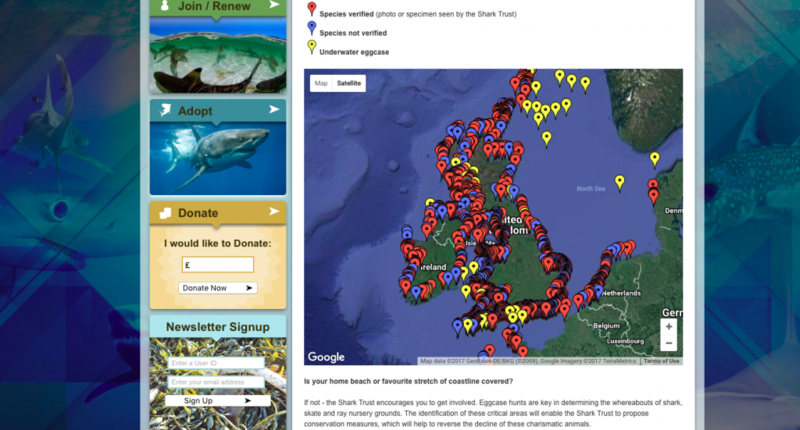 If you’re interested, there are eggcase ID leaflets (with information on how to submit your findings) available from my office at the Tiree Rural Centre. Our next session was Beach Bingo – a family scavenger hunt to spot and identify different items on the seashore. In essence, this was an excuse to dole out a few sweeties (!) but the children did practice identifying different colours and textures – or different types of seaweed, seashell and gull for the older participants. 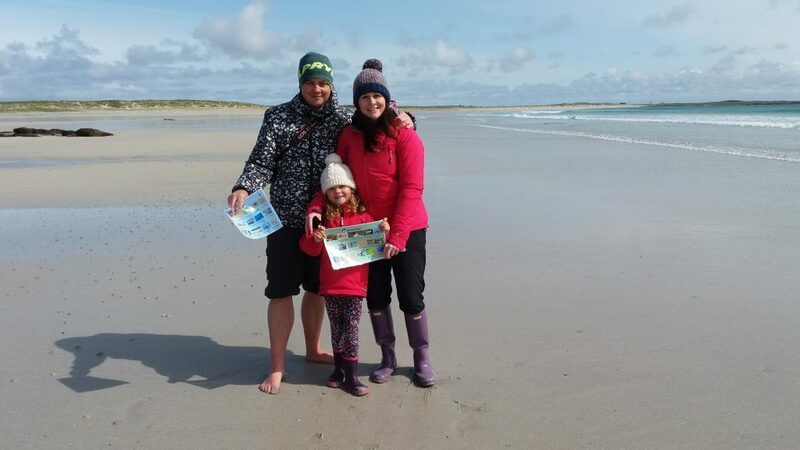 One of our holiday families, taking part in the scavenger hunt together on Crossapol Beach. This event caught the tail end of the Easter break and attendance by visiting children was good. 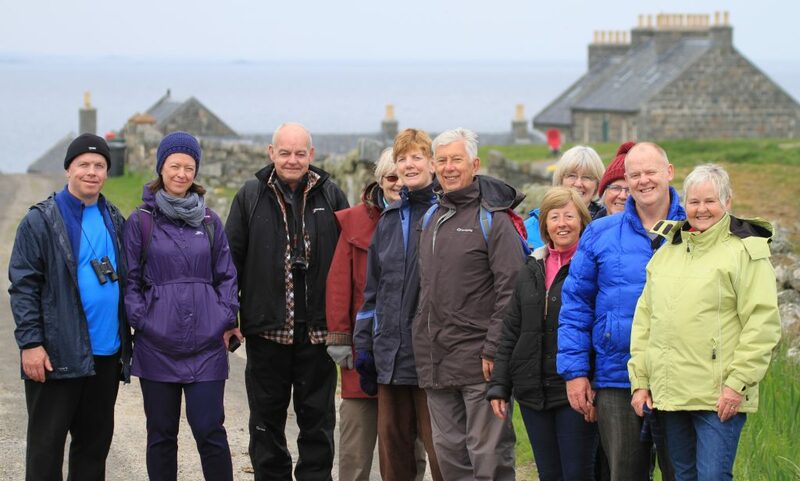 The third event of the year, Seòid a’ Machair, was a guided walk jointly led by myself and Donna MacLeann – Tiree’s Music, Culture and Communications Coordinator. 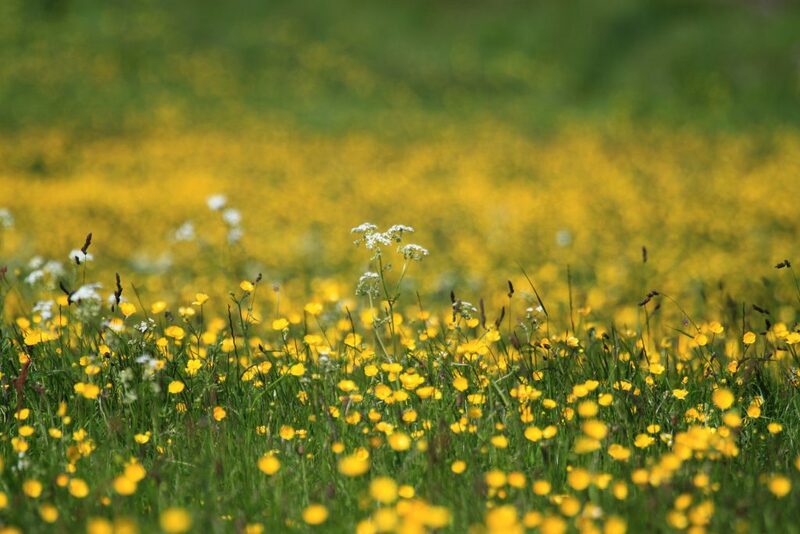 We explored the formation of Machair; learning how traditional crofting practice supports Tiree’s impressive biodiversity. Janet Bowler gave us an introduction to the rare bee species that she monitors here, and spoke about her ongoing project to encourage the planting of native wildflowers. With Donna’s expertly prepared handouts and pronunciation guides, we learned the Gaelic names for many species that we encountered on the way – in addition to hearing about the language’s history and modern use on the island. 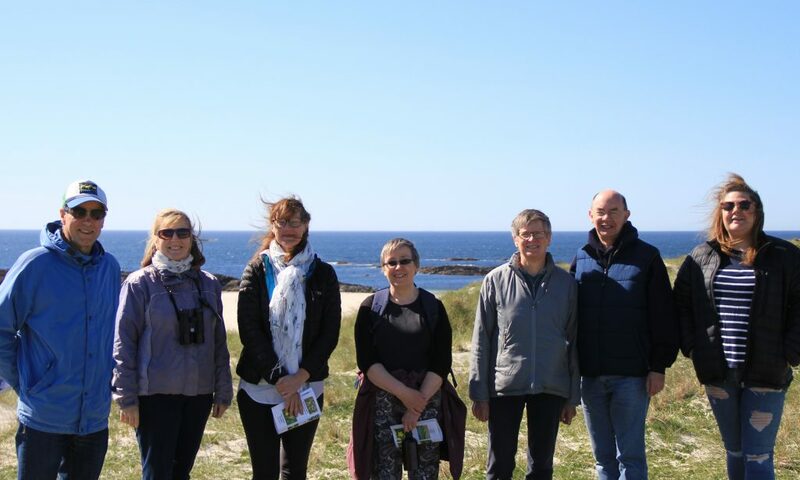 Guests on our Seòid a’ Machair walk: A bright and breezy day to learn about Tiree’s wildflowers. Tiree’s Machair display is building, with new species and new colours gradually appearing in succession. On May 12th, I led a short but terrifically enjoyable Wellness Walk down to Lag na Cleite. Though the walk wasn’t intentionally aimed at viewing wildlife, there was simply too much to ignore! Highlights included lovely views of Great Northern Diver, Common Eider, Arctic Tern, Lapwing, Redshank, Ringed Plover, Turnstone, Dunlin and a tiny Lapwing chick. The following week, I was joined at Loch a’ Phuill by an enthusiastic group of Learner Birders. We got to grips with the basics of bird identification using our ID books and the new Tiree Ranger Service telescope; looking at a number of different wading and water species. One particular highlight was a group of distant waders – which turned out to be a late passing group of female Black-tailed Godwits (thanks to John Bowler for following this up). One of these birds was wearing leg rings, which indicated that she had originally been captured by French ringers. The same small party had been spotted in Ireland just days before. Guests on our Learner Birders walk: It was brilliant to see so many children joining in with this event. Building on the enthusiasm of Leaner Birders, our next session took us to the windy tops of Ceann a’ Mhara for some Super Seabirds. 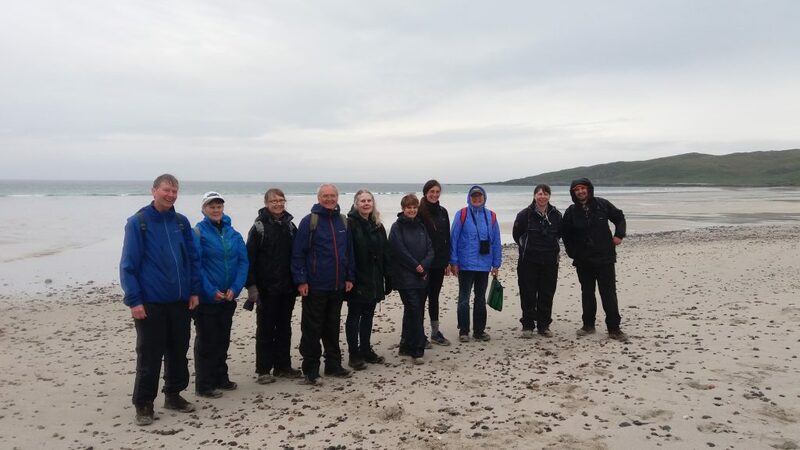 Though the focus of this walk was primarily cliff-nesters, we actually experienced a really diverse array of plant life and some very interesting natural history finds – such as the brightly coloured shells of predated seabird eggs. There was quite a bit of rain on the day; but the walk was still one of my season highlights so far. 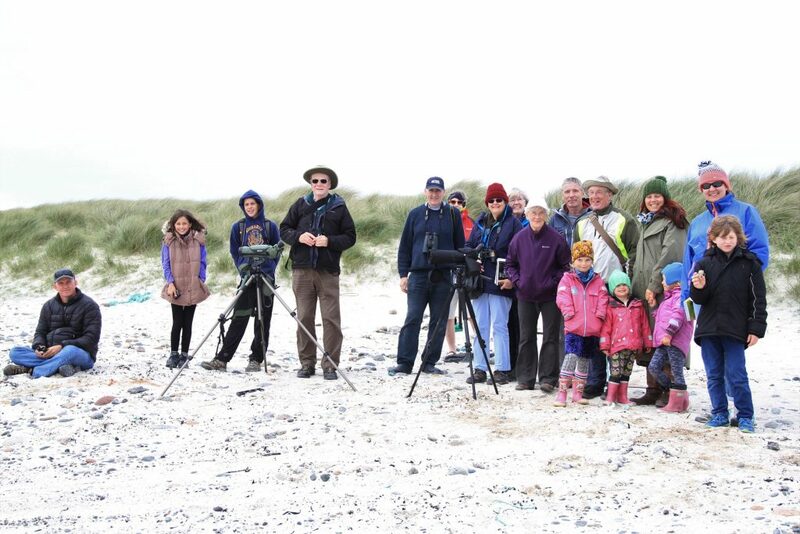 Guests on our Super seabirds walk: They were a hardy bunch, and excellent company for this four hour session. In addition to learning about our environment, Tiree Ranger Service is here to encourage people to look after it. 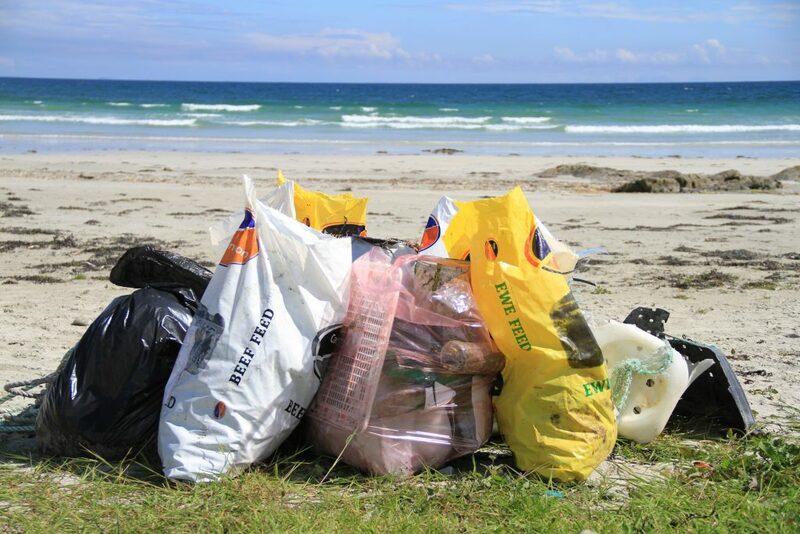 On June 3rd, around 40 community members from across the island joined a Tiree Community Development Trust Big Tiree Tidy session to clear Crossapol Beach of debris. Just one of the many piles of litter that we collected. I drive past Crossapol Beach every day; it’s a treat to see it looking so pristine. There is a lot of enthusiasm, and there are lots of great ideas, within our community. Watching people and their children come together and take time out of their day to help was rewarding. A special mention needs to go tour local Argyll & Bute Council Workers, who very kindly offered to come and collect the material from the roadside. This made a difficult job much easier and was greatly appreciated. 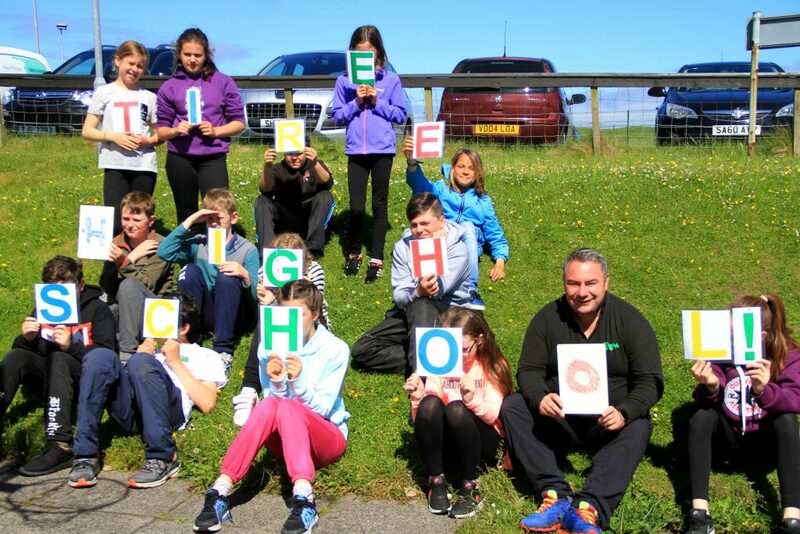 June 8th saw me out and about early, placing riddles and clues along an 8Km cycle trail for the children of Tiree High School. The Tiree Treasure Trail activity was part of a two-day programme to help P7 students through their transition to S1 after the summer break. The questions and clues had a broadly environmental and healthy living theme, and the students did a brilliant job of both finding and solving them – in fact, I think I rather underestimated their abilities?! I’d like to thank the children for being so sporting, and for their good behaviour and friendly manner throughout. To quote one student it was “slightly better than doing maths” – be still, my ballooning ego. I’d also like to thank Will Wright of Tiree Fitness for his contribution of spare bikes, helmets and equipment checks; plus the other staff leaders (including Willie, our island Youth Worker) for helping me to guide the group around Tiree’s roads safely. Clearly, the students couldn’t wait to get their photograph taken at the end of the session… The letters were collected after answering the clues (we missed a couple, so dry-wipe boards were used as stunt doubles to preserve literacy standards). Our Guided Walk Programme is now available and running weekly on Thursday afternoons. Events, such as those featured above, normally run on Fridays and are advertised locally and through our social media accounts [Facebook & Twitter]. The first trip around Salum and Vaul produced amazing behaviour from the Salum Common Seal colony – with animals play fighting and leaping out of the water in the shallows. Three routes will run on rotation until further notice – but please note that advance booking is essential! 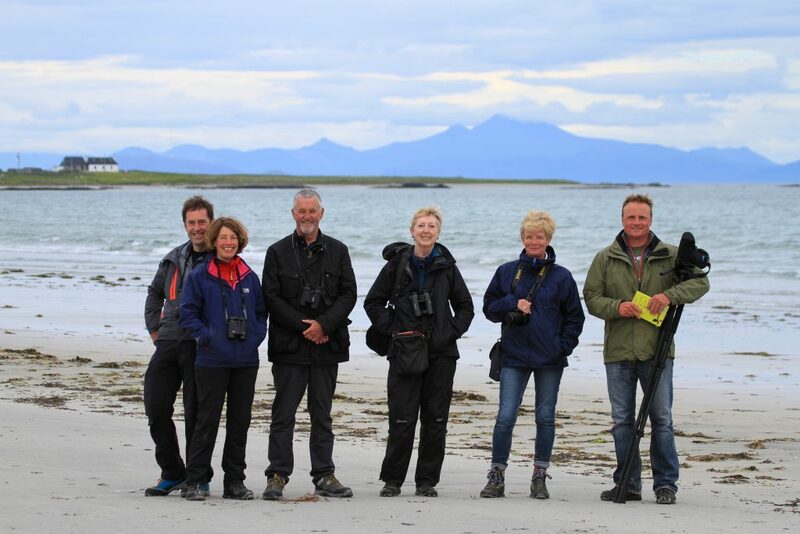 My group for the Salum and Vaul circuit – we saw lots of wildlife, but the seals definitely stole the show.